This outstanding 1950 Studebaker Champion Starlight Coupe Street Rod belongs to Bill and Marilyn Hower of Lake Havasu City, Arizona. The body has been lowered but is otherwise stock except for modern halogen blue-tint headlights. 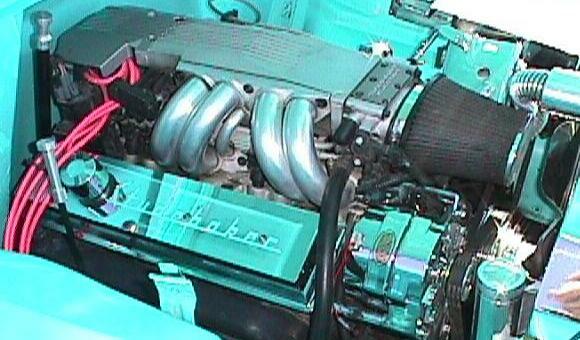 Power comes from a Chevrolet 305 V8 with a Chevy tuned port injection (TPI) fuel injection system and GM 700R transmission connected to a 8" Ford rear end. The suspension includes Firestone air bags front and rear. 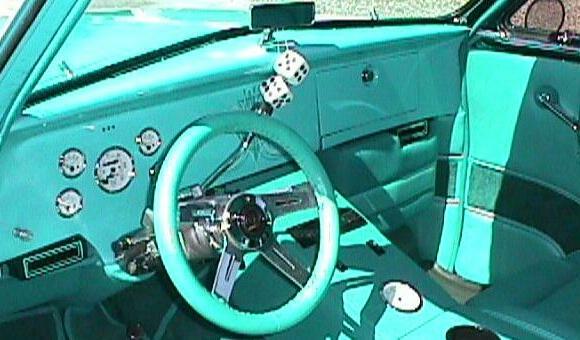 The body color is "Strato Turquoise" and the interior features custom Camaro six-way bucket seats with full console and VDO guages. Amenities include air conditioning and a custom upolstered trunk to match the interior. Bill has contributed a number a pictures taken at various car shows to this page. I'm pleased to feature his car on this page. 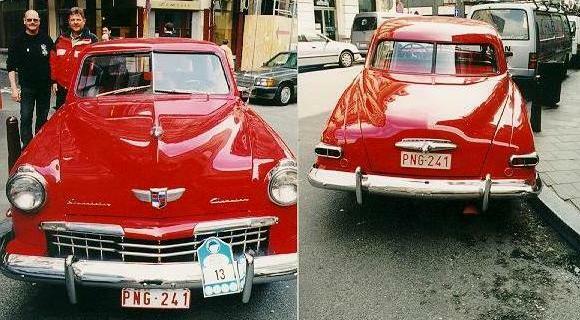 Alan Vercammen-Grandjean of Brussels, Belgium sent these pictures of his two outstanding vintage Studebakers. Note that the cars have consecutive license plates! A distributor-owned plant in Belgium assembled Studebakers from completely-knocked down (CKD) kits for the European market. One tale about the plant in Belgium is that it produced 1957 Hawks with or without fins as the owner desired. 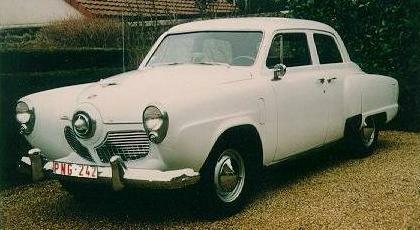 Local distributors in Denmark, Sweden, and Ireland also assembled Studebakers for Europen consumption. Outside of Europe, Studebakers were assembled at one time or another by local distributors in Australia, Brazil, Egypt, India, Israel, Mexico, and South Africa. Many of these plants sourced some components locally, particularly upolstery and trim items. This led to some interesting variations in foreign markets. Studebaker's operations in Canada were company owned. While CKD kits were usually shipped from South Bend, completed cars for the export market were often assembled in and shipped from Canada. Anson is a relatively new company that is producing a quality line of 1:18 scale diecast classic cars. 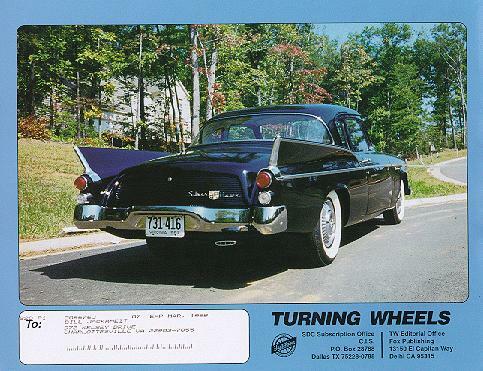 One of the company's first releases is a very nice Studebaker Golden Hawk with opening doors and hood, detailed interior, and front wheel steering. This model is also available in black with silver fins, gold with white fins, and red with white fins. Anson models retail at around $20 each and are usually available at KayBee Toys. To see more toy Studes, visit my Studebaker Toys Home Page. Click here for information on ordering a toy Frankenstude Hot Rod, 1961 Champ Truck, 1951 Starlight Coupe Hot Rod, or Modified 1953-54 Starliner.